“I’m still a little bit wary when I look back on these issues and I’m asked to write an intro for them,” Fabian Niceza’s introduction (reprinted from an earlier collection) suggests, “because for as much as I fondly recall the enthusiasm, the uncertainty, the fear and the gung-ho cockiness we mixed together in working on these stories, I also feel that it was a bit unfair, in retrospect, to expect us to hit a home run in our first time at bat.” It’s a fair point, to be honest, and it’s a brave confession. X-Cutioner’s Song isn’t a perfect crossover. It isn’t even a very good one. However, it is a deeply fascinating one in many ways, because you can detect the seismic shifts occurring in the background. However, you can sense the ties to the past, the sense that the book shouldn’t stray too far from “what worked” before. In particular, writers Fabian Niceza, Scott Lobdell and Peter David return to Chris Claremont’s ridiculously tangled Summers family tree. Much of the artwork in the collection – with the notable exception of Jae Lee’s superbly atmospheric and stylistic work on X-Factor – seems designed to recall the sort of sharp work Jim Lee used to turn out. That’s not to suggest that there weren’t new ideas (in fact, Niceza shrewdly points out that Stryfe’s Strike File sets up years worth of stories), but just to observe that the story is located at something of a crossroads between the past and the future. I think it’s hard to make sense of the nineties, in hindsight. It was a post-Cold War, pre-9/11 world. The Berlin Wall had fallen, capitalism had won. There were conflicts, as there always are, but they were relatively contained and far away – places like Bosnia and Iraq. Chris Claremont had found a nice hook for Uncanny X-Men by tying it into the social issues of the day, crafting a racism allegory for a Civil Rights era comic book. What happens when there is nothing to respond to? What happens when the real-life situation driving your central metaphor expires? 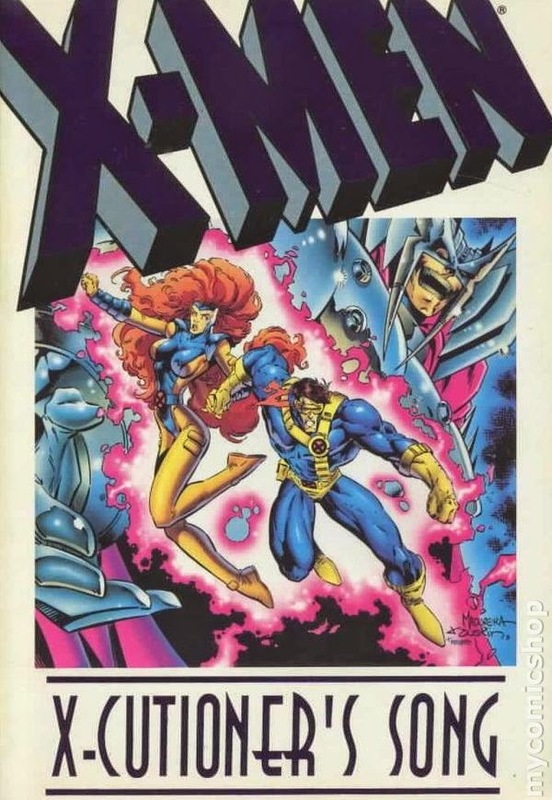 X-Tinction Agenda, the last major X-Men crossover, had seen Claremont cling desperately to his “mutants-as-oppressed-minority” metaphor by presenting readers with a fictionalized counterpart to South Africa’s racist apartheid system, with the fascist state of Genosha. It was a last-ditch attempt to anchor the books to the issue of race, something that was becoming increasingly difficult in an increasingly PC world. That’s not to say there wasn’t mileage left in the metaphor (Grant Morrison would shrewdly play it out in New X-Men, as would Peter Milligan in X-Statix), but that it couldn’t continue to be used in the same way. As such, it should be no surprise that X-Cutioner’s Song opens with the attempted assassination of Charles Xavier. After all, the dream is over, so to speak. Magneto had been removed from the book a little while ago, so placing Charles at death’s door seems like a fair way of acknowledging the ideological conflict between the two was a relic best left in the past. Of course, Magneto would inevitably return (in fact, Niceza concedes that he considered bringing Magneto back in the middle of this storyline) and Charles doesn’t die, but that opening issue makes a bold philosophical statement. The times, they are a-changin’. However, the crossover suffers from a massive lack of consistency, as well as some difficulties with the general direction. As Niceza notes in his introduction, the writers handling the crossover were still relatively new to their individual assignments. To expect them to handle a massive crossover would be even more difficult, as they were still finding the voices for their own books. As such, the quality, tone and themes of the crossover seem to shift as we move from one chapter to the next – the crossover feels like the disjointed effort of three different authors with three different styles. Niceza is perhaps the writer who does the best with the big superhero melodrama, and who seems to grasp the core of the crossover. He has a solid understanding of the core X-Men dynamics. In particular, I like his exploration of the idea of family with X-Men comics. After all, the X-Men are one giant surrogate family, covering for the fact that each of the members seems to have difficulty with their own biological relatives. Scott seems to get on better with his team mates than his brother and is, as the crossover notes, an absolute failure as a father. Peter uses the team to cope with his brother’s suicide, unsure how to tell the rest of his family. X-Cutioner’s Song is the story of the tangled Summers family, juxtaposed against that of the X-Men family. By all accounts, Scott’s family is a broken unit, a group of people related by blood and cursed by a bond that none of them ever sought. Scott and Jean spend most of the story dealing with their failure as biological parents in isolation, on their own terms. In contrast, Professor Xavier spends the whole story surrounded by his surrogate family. Even unconscious, he’s never alone – despite the fact that he is not related to any of the team by blood. Apocalypse remarks that Xavier’s X-Men “play the part of the family” remarkably well, and Niceza’s Uncanny X-Men and X-Force issues tend to emphasis this point. Indeed, more than any other X-Men event, X-Cutioner’s Song is fascinating because so much of what is important to it is happening unseen in the past or in the future, though the story itself unfolds in a somewhat listless present. Stryfe is a rebel from the future, seeking to pay Scott and Jean back for “a legacy of hatred! a legacy of decay!” And yet we never see him develop as a character. We never really see what twisted him so much, or what it is that he’s responding to. The same is arguably true of Cable, who is stuck in a present fighting against a terrible future that is yet to materialize. And yet, X-Cutioner’s Song is never really about time travel. It’s just a crossover where all these sins – past and future – have come back to face the team in an almost contextless present. “How can they defeat me, when I am their tomorrow?” Stryfe asks. In fairness, Niceza’s writing isn’t particular strong, but it isn’t particularly weak. It’s just straight-forward superhero stuff, for better or worse. I do like the way that he’ll acknowledge the old tried and tested cliches that he uses as he writes, rather than simply falling back on them as simple crutches. The problem is that each of the three writers have markedly different styles and approaches, and so it feels almost like the story is shifting genre as the reader moves from one chapter to the next. The other side of the coin is that David’s characters feel somewhat wrong when handled by other writers. Members of his X-Force, in particular Madrox or Strong Guy, seem slightly “off”in the hands of the other two writers on the crossover – it’s clear that Lobdell and Niceza are trying to channel David’s witty self-aware dialogue, but it doesn’t work quite as well. Reading David’s chapters made me wish that Marvel would consider releasing his X-Factor runs (both the one here and the current one) in a nice oversized hardcover. It’s one of the X-Men books that very clearly has its own particular voice, and its own place in the shared universe. Of course, I’d also love to see his Incredible Hulk run collected in a similar format, or even in the omnibus line, but I imagine that’s a long way off. However, the weakest of the trinity of writers working on the book is Scott Lobdell. It’s somewhat ironic that Lobdell would be the writer tapped by DC to script several of their “new 52″ titles, because his issues here seem to demonstrate a lot of what is wrong with nineties comics. There’s a perception that nineties comics were a wasteland, and I’d argue that’s hardly fair. There were any number of important and iconic and clever comics being written inside and outside the mainstream, it’s just that particular art styles and writing styles became dominant. There are several problems with Lobdell’s writing. The most obvious is his awkward reliance on cliches. Okay, I know that this is the X-Men we’re talking about, but it’s no need for such lazy writing. At least when Fabian Niceza falls back on those familiar storytelling devices, he’s honest enough to have the characters point it out. Instead, Lobdell just used these sorts of outdated plot devices without a hint of self-awareness or irony. “I should take this opportunity to slay them — to cull the chaff from the wheat,” the villain Apocalypse suggests as he stands of a bunch of subdued X-Men, “but to slaughter an unconscious foe is so — unseemly.”That’s just bad writing. Still, the biggest problem with X-Cutioner’s Song is the lack of a strong thematic continuity between books. There’s never really a sense of what the event is “about”, apart from an attempt to reveal the identities of Stryfe and Cable. In fairness to Niceza, he tries to make that lack of a theme a theme unto itself – the assassination of Charles Xavier representing the fading of the potency of the “mutants as minority”allegory – but it’s never strong or clear enough to truly work.